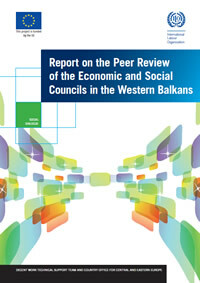 A peer review of the structure, functioning and effectiveness of existing Economic and Social Councils (ESCs) was carried out in each of the six target countries in the period November 2016 – March 2017. The reviews were focusing on five key issues: 1. Mandate and role of the ESC; 2. ESC Technical Secretariat; 3. Members of the ESC; 4. Impact of the ESC and 5. Listing recommendations to overcome the challenges faced by the ESC aiming to improve the functioning and effectiveness of the ESC. ESAP provided support and guidance in drafting of the final reports, including recommendations in order to ensure overall quality consistency of the process and outputs. Each ESC reviewed two other ESCs and has been reviewed by two ESCs. In the case of Bosnia and Herzegovina separate assessments of the Economic and Social Council of Republika Srpska and the Economic and Social Council of the Federation of Bosnia and Herzegovina were conducted. ESAP provided support in drafting of the final reports, including recommendations in order to ensure overall quality consistency of the process and outputs. Conference held in Belgrade on 5–6 July 2017.